The Greater Building Society, one of Australia’s Top 500 privately owned companies, is in a very competitive financial services market. In an industry where a large degree of “sameness” is prevalent, the Building Society needed to distinguish its Home Loan product from that of its competitors. Nearly every Bank, Credit Union and Building Society used a “12 month discount honeymoon rate” as their major acquisition tool and up to April 2001, the Greater Building Society was no different. 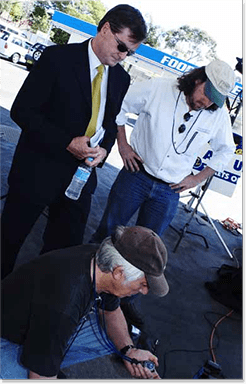 John devised an acquisition promotion that was absolutely unique to the industry and packed an extraordinary “wow factor punch”. The concept was very simple. Offer consumers a unique benefit that cannot easily or quickly be duplicated by competitors. In April 2001, the concept was born, heralding the start of the Greater’s “Get a home loan, get a free holiday” offer. In conjunction with a travel wholesaler, The Greater provided a free holiday to consumers who gained a home loan with the Society. Consumers received reward points on a pro-rata basis proportionate to their home loan and then simply redeemed these points for holidays, which were detailed in a special Holiday Directory (e.g. Someone who gained a $200,000 home loan, may have enjoyed 5 night’s holiday in Queensland, someone who borrowed $300,000 may have enjoyed a week’s holiday in New Zealand.). The acquisition tool of the Free Holiday was so successful in its “test period”, the offer became a product, very similar to the McDonald’s Happy Meal phenomenon. The McDonald’s promotion was so successful that it turned into a fulltime product offering. The result of this unique customer acquisition concept took many by surprise. The Building Society’s Home Loansquickly doubled and as a result the Home Loan/Free Holiday offer became an ongoing product category. Within 2 years, the Society’s loans had tripled! Aside from new homeowners, the offer was so appealing that re-financing became a large component of the Society’s overall loans. After all, why stay with a Bank that charges high fees and gives you nothing, when you could swap your home loan to the Greater Building Society and get an absolutely free holiday? The concept was launched via heavy television advertising and when the offer reached its 6-month mark, “Customer Testimonials” became an integral part of the communications tactics. The offer has been running continually since April 2001 and shows no signs of waning. The success of this marketing ploy has contributed to catapulting the Greater Building Society’s Home Loan Portfolio to a level that exceeds it’s major Building Society competitor, that being The Newcastle Permanent. This feat was extraordinary, given that The Newcastle Permanent Building Society had traditionally out-lent The Greater by a considerable margin for more than 20 consecutive years earlier. Further more, the level of increase in home loans throughout this period, was about double that of the major banks. Once again, the “get a home loan/get a free holiday concept” is testament to the philosophy of “wow factor marketing”. Building Society’s home loan offer!! With interest rates rising in late 2003 / early 2004, the Australian home loan market understandably “settled” in comparison to the previous three or four years. (Keeping in mind that the Greater’s increase in home loans throughout the boom period, was about double the industry standard¸ due to the free holiday offer!) Given the increase in interest rates and market conditions, John once again convinced the Building Society to “push the envelope” and create an additional “wow factor” to its home loan offer. This Home Loan “Value-Add incentive” launched via an exciting advertising campaign, comprising of television, radio, press and direct mail. When consumers got a home loan through the Building Society from this point, they not only received a free holiday, but now 10 cents per litre savings on their petrol for a whole year. 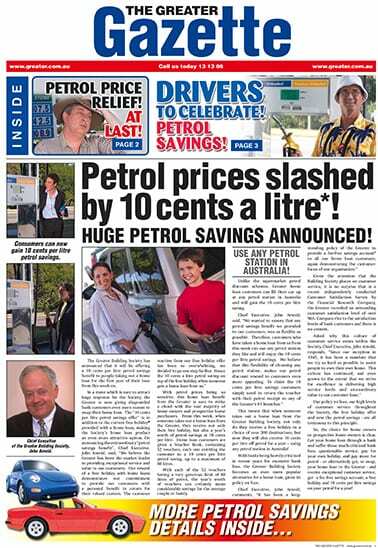 And, unlike the supermarket petrol discount schemes, where consumers were forced to use specific petrol outlets, the Greater’s offer allowed consumers to use any petrol station in Australia! This of course is a huge bonus, as it means consumers have a massive choice. So, in October 2004, the Building Society introduced an additional benefit to new home loan customers, being “10 cents per litre savings on petrol!” John recognised that like “free holidays” savings on petrol is something that people surely would always be interested in. Besides, similarly to holidays, petrol savings is something that appeals to all demographics. One can always have too many televisions, CD players or microwave ovens …. “but one can never get enough free holidays or petrol savings” in John’s opinion. Furthermore, John ensured that the Greater’s advertising highlighted the fact that its “10 cents per litre savings” was additional to any supermarket discount one might use. 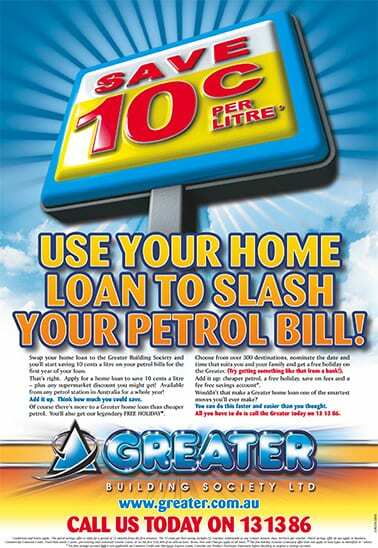 In other words, a Greater home loan customer could use the 4 cents per litre supermarket discount together with the Greater’s 10 cents per litre savings and make a total savings of 14 cents per litre! Therefore, John ensured that a major component of the “free holiday / petrol savings” home loan campaign was a comparison with banks. One example of this was the split screen television commercial which showed a Greater customer filling up his car with petrol, enjoying petrol savings, free holiday and no fees – versus a bank home loan customer with bank, who pays full price for his petrol, pays for his own holidays and puts up with bank fees. When such advertising hits the TV screen, it certainly not only jolts viewers with its “wow ingredients”, but it also clearly distinguishes the building society’s offer against the banks’ offers. Press play button to view 30 second TV Commercials for Home Loan “petrol offer” campaign. 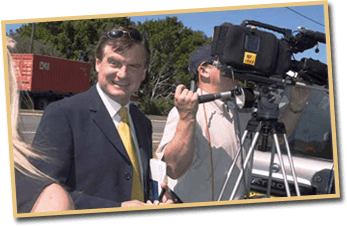 During the launch of the “petrol incentive” in October 2004, John organised with numerous radio stations, an exciting petrol promotion which provided further publicity to the Greater’s home loan offer. Radio stations simply gave away “10 cents per litre petrol savings for a quarter of a year” to listeners who phoned in response to the radio contest. The Greater produced special Promotional Petrol Voucher books for the radio promotions and provided these as prizes, in return for the massive publicity generated by each station. When one promotes such an extraordinary home loan offer in such an entrepreneurial fashion, its “wow” upon “wow” upon “wow”! With the Greater Building Society being one of the fastest growing financial institutions in Australia, John’s philosophy seems to be paying huge dividends! Some year’s earlier, John was asked by his client, the Greater Building Society, to play the role of a nasty Bank Manager in a series of television commercials which he had conceived. Some time earlier, John had devised a television concept which clearly distinguished banks from the Greater Building Society. The commercials were to feature a rude and nasty Bank Manager, along the lines of John Cleese’s “Faulty Towers” character. With customer satisfaction levels with the big banks being at a low level, this was an optimistic campaign to really strongly distinguish the “high service and no fees benefits” of being a customer of the Greater, versus the “poor service and heavy fees environment” of the banks. The campaign featured the nasty Bank Manager (played by John) treating customers with disrespect, particularly when they had the audacity to ask for the same service and benefits they could receive at the Greater!